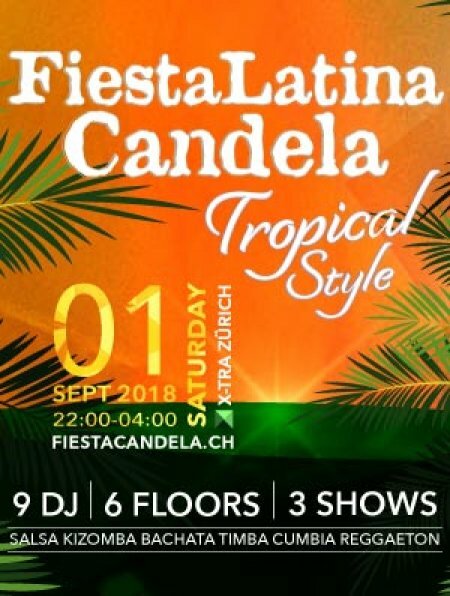 On Saturday, Sept 01st, 2018 "Fiesta Latina Candela – Tropical Style" presents at club X-TRA Zurich a memorable night filled with the finest Carribean rhythms like Salsa, Son, Kizomba, Merengue, Bachata, Reggaeton, Timba Cubana as well as Cumbia and Vallenato. 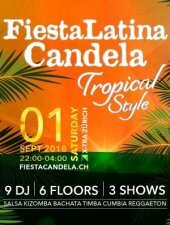 An entertaining journey through six different worlds in Carribean atmosphere with the juiciest drinks, the best DJs and the most spectacular and most recent Salsa shows. Salsa shows with Cubana Company from Matera, Italy, Mijail & Yanieri from Cuba and Bern as well as Salsabrosa from Baden! Star-DJ Flecha from London! DJ U.S. Thaler is a guarantor for good old Salsa, Son and Bachata and is located in the Salsa Lounge. Salsa-Shows with Cubana Company from Matera, Italy, Mijail & Yanieri from Cuba and Berne, Salsabrosa from Baden! Star-DJ Flecha from London and DJ El Montuno from Zurich! Old School Salsa Dura Salsa Clásica, Romántica played with Vinyls in the nostalgic atmosphere of the "Palladium" in New York. Responsible for the music are DJ El Mono (Zurich) and DJ Polito el Perucho (Pavia/Italy). This floor is located opposite the main dance floor. The well known DJs Solido Rey and DJane Liliana play the best Reggaeton, Merengue, Bachata and Hip Hop. DJ Dereck sets the trends in the local Kizomba scene. This floor offers space for a whole night of the most sensual dance of the presence. DJ Benji from Colombia shares with you the best Salsa clásica, Cumbia and Vallenato. Qué rico!